I've been neglecting my blog, so sorry; I wish I were Wonder Woman but I'm not and I just can't get everything done that needs to be. Halloween this year was strange in our area, not many trick or treaters out and not many people with their lights on giving out candy and I even took my son to another neighborhood that boasts to have a happening time. Oh well, there's always next year. This months contest theme for the Paper Twirlies etsy team of course was Halloween, I'm thrilled to say I won again but it was by default; there were no other entries. I know everyone is so busy, and I probably shouldn't have done one either but it turned out cute and it's sitting on my desk at work; at least till Monday. 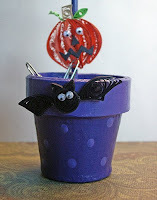 So the winner is Halloween Paper Clip Holder, with it's purple polka dot base and oh so cute bats, pumpkin and ghost. Hope you like it, I've made paper clip holder's in the past but they were all flowers so this was a little different but it turned out pretty nice. I'm going to also do some holiday/christmas one's since this one turned out so cute. Well I've got lots of quilling to do still, I'm going to put Life On Mars on the computer while I get creative and have fun. Don't forget to turn your clocks back tonight before going to bed, hope I remember.